For the Belgian national team nicknamed "Red Devils", see Belgium national football team. Red Devils or Bulgeun Angma (Hangul: 붉은 악마, Hanja: --惡魔) is the official supporting group for the Korea Republic national football team. The club was established as the "Great Hankuk Supporters Club" in December, 1995. The current name, "Red Devils", comes from a term coined by the international media in 1983 when the Korean youth team reached the semi-final of the 1983 FIFA World Youth Championship. 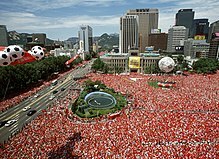 Because the national football team's official jersey color is red, the media dubbed both the team and supporting fans "Red Furies", and it was translated as "Red Devils" in Korean. The name was selected in 1997 as the official name of the organization. The trademark mascot for the Red Devils is Chiwoo Cheonwang (Hangul: 치우천왕, Hanja: 蚩尤天王). A legendary figure in ancient Chinese and Korean history, the stories of brave Chiwoo Cheonwang influenced Korean folk tales and was interpreted into various designs of dokkaebi, which would be used in decorations for royal tombs and roof tiles. As Chiwoo Cheonwang is known as a symbol for victory and a guardian figure, the dokkaebi-like trademark was chosen to represent the club. Membership is open to those who wish to support the Korea Republic national football team, but anyone who wears red and supports the national team during games is considered a Red Devil. Many activities and gatherings are organized through the official homepage. Although the headquarters are situated in Seoul, there are many club centers throughout the country where one can attend. the Red Devils organized an effort to clean up the litter and involved citizens to participate in the cleaning process. They showed that they weremodel citizens by keeping things clean at the stadiums and streets. The main activity for the Red Devils is supporting the national football team, i.e. cheering. The cheering of the Red Devils is noted for being highly organized and extremely passionate, so much so that they are called "the 12th member" of the football team. The most common cheer is in a cadence of shouting and clapping: "대~한민국! (大~韓民國, Dae~han Minguk, Republic of Korea)" followed by five claps (clap-clap—clap-clap—clap--, the second and the fourth being half notes). The clapping is usually accompanied by percussion instruments like the Korean drum buk or thundersticks to keep the beat. Supporters also cheer by singing the famous Korean folk song, Arirang, and various songs made for the World Cup. Cheering is done in stadiums, theaters and also many public plazas and squares in front of jumbo screens. On homeground, the Red Devils usually sit behind the goal at the northside of the stadium. Enthusiastic members make groups in order to attend homeaway games in foreign countries as well. FIFA Fan Fest was influenced by this Korean-style street cheering. Supporters wear red, like the national football team players. Devil horns and other adornments are popular as well. Wikimedia Commons has media related to Red Devils (South Korea). This page was last edited on 30 July 2018, at 03:38 (UTC).